Choose two background papers. One should take up 1/3 of the left side of the page, the other should take up the remaining 2/3rds of the right side of the page. Use vertical stitching or a very tall and narrow paper strip to overlap where the two background papers meet. The stitching or paper strip does not need to span the entire height of the page. About 1/3 of the way down the page vertically on the "right side" of the page (the right 2/3rds), place three images in a horizontal row. The pictures should be about 2 inches tall at most. Create a mat for the left most picture that peeks out just a little bit on the top and left side of that photo. 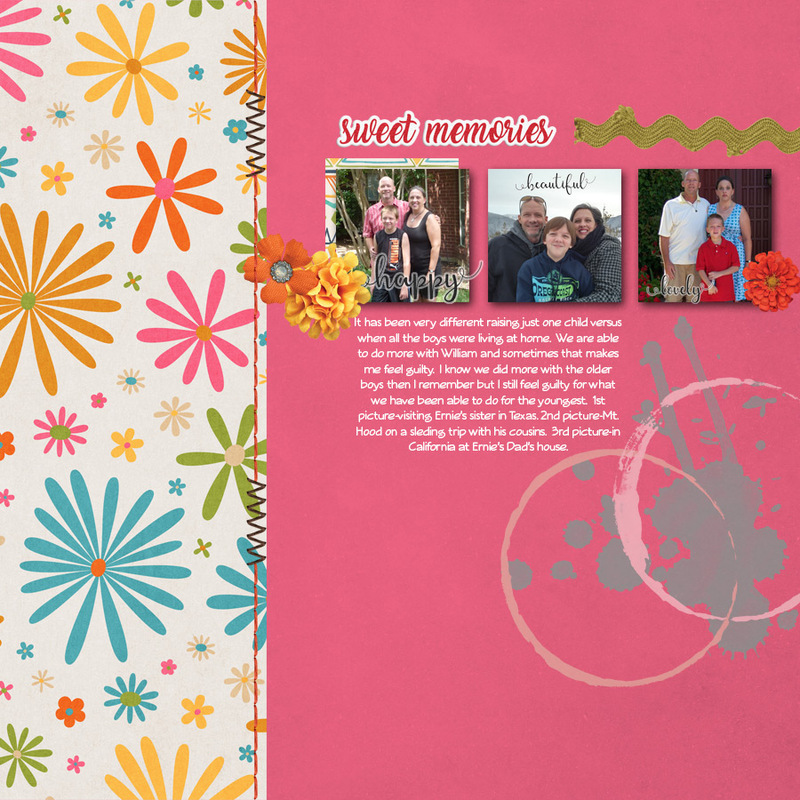 In line with the photos on the right side, place a large title or word art in the left 1/3rd of the page. Above the images, and starting from the left edge of the left most picture, place a subtitle or embellishment. 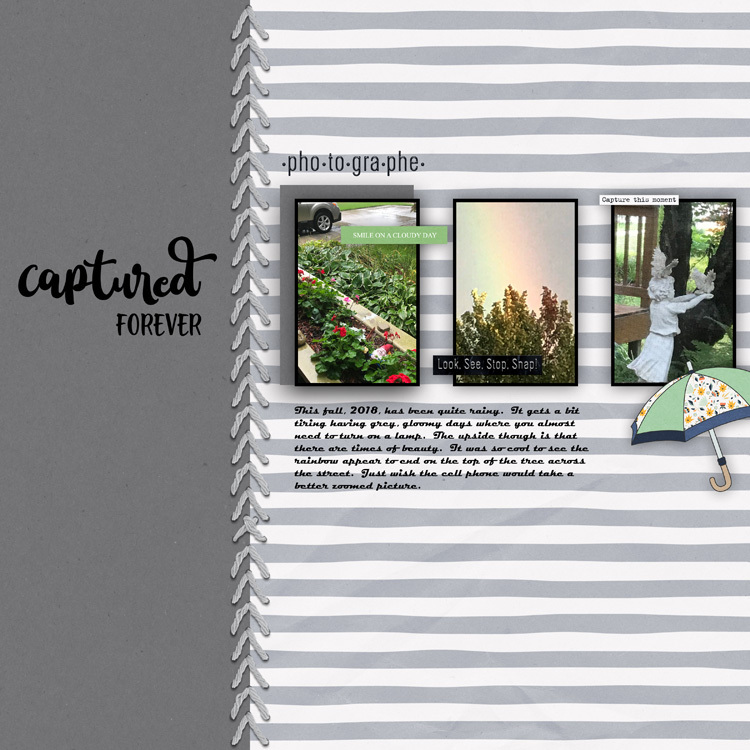 Below the row of three pictures, and starting from the left edge of the left most picture, create a journal block that spans no more than 2/3rds of the width of the entire row of photos. Use three word bits (or make your own) and place one on each of the photos. 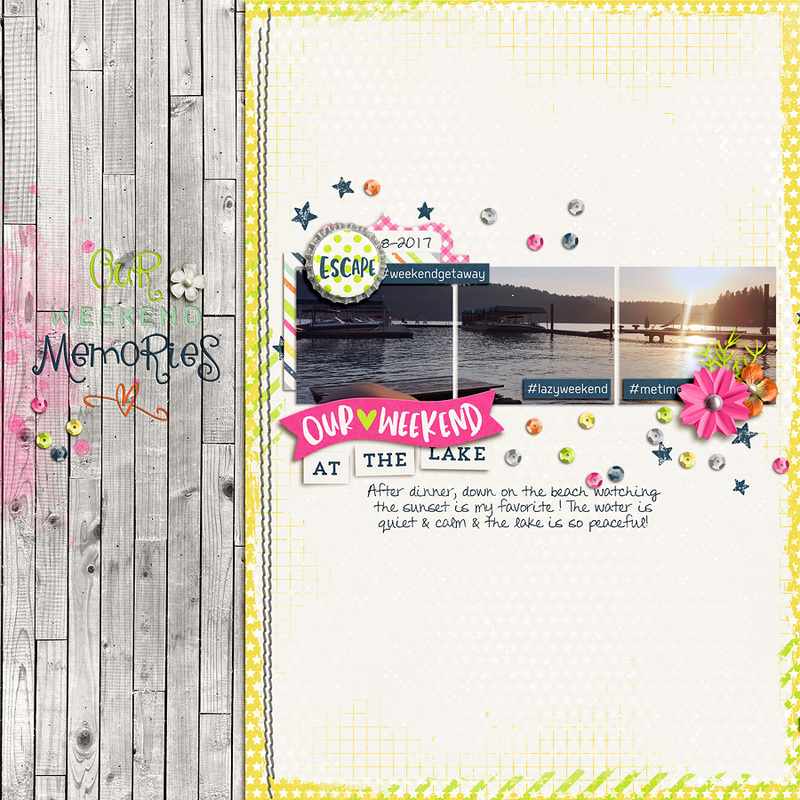 Placement is up to you and the word bits can be either horizontal or vertical, up to you! On the right side of the bottom edge of the right most photo, add a flower or other embellishment. Add any additional embellishments, background paints, etc. that you would like! Remember, you must post your LO in this Challenge Gallery and then in this thread no later than 7p.m. PST on Sunday, October 6 (convert, of course, for your own time zone). Your layout or project must use 100% TDP product. Your layout or project must follow the Slow Scrap instructions listed above. 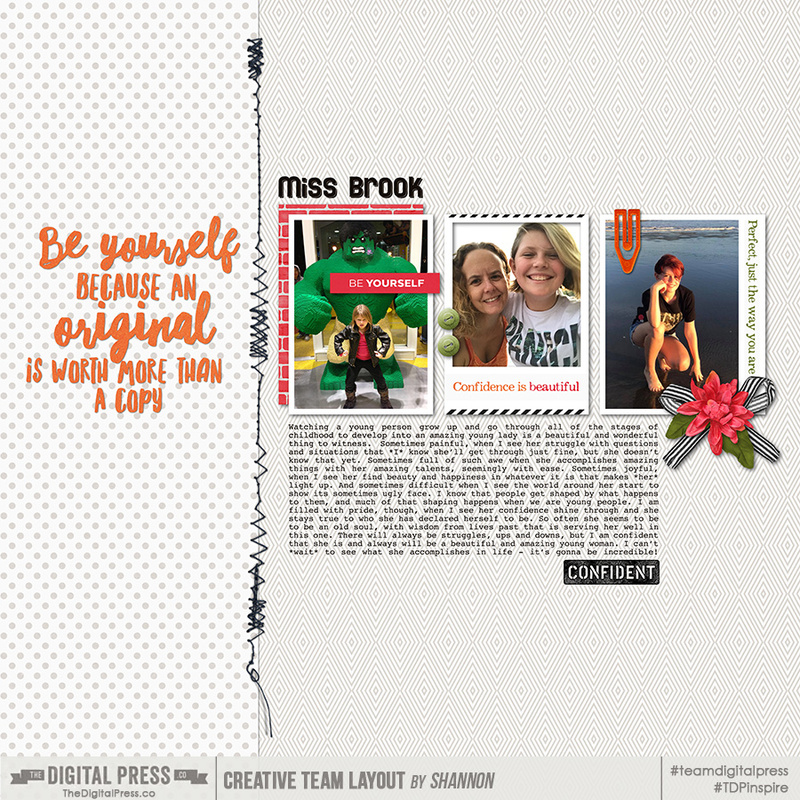 You must post your layout in the TDP gallery and posted in this thread with a gallery image link. Your layout must be posted in this thread no later than 7:00pm PT on Sunday, October 6 in order to be eligible to win one of the CHOOSE YOUR OWN PRIZE awards (don't forget to visit that thread and put your prize choices in rank order!). Winners will be announced in the TDP newsletter on Friday, October 12. Have fun! I can't wait to see what you guys create! Mark it down -- set a phone reminder/alert -- stick a post-it on your fridge -- whatever it takes to remember to come join us tomorrow night! We'll have a 1-hour (approx) chat... there will be prizes and giveaways... and slow scrap instructions will be posted in the forum, as well (for those who can't attend the chat portion). Last edited by shannonc; 10-08-2018, 08:28 AM. 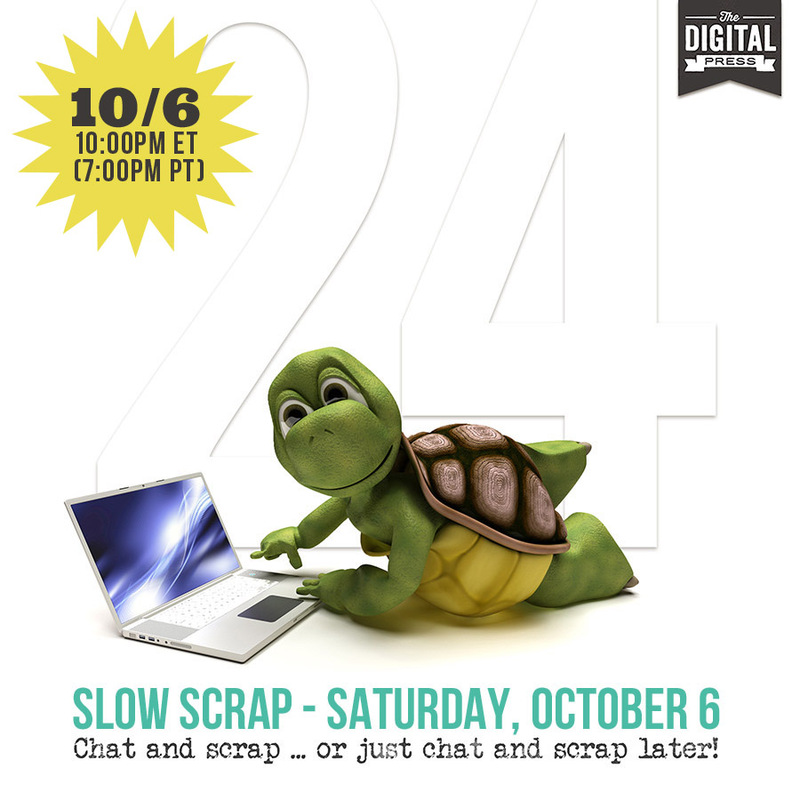 Don't think I'll be able to attend the chat but I look forward to participating in the slow scrap. Scheduled WITH a reminder in my phone! I'm hoping to catch the back end of the chat! We have a hockey game at 1900 CST and if the traffic fairies are good to us this night, we should be back for me to get some of it! Can't wait! if i have well understood it will be 4 AM there. So i'll be in my bed. Wonderful, Tiffany! I love your color palette. Finally just posted the original (sorry for the delay) so you can see where everything started. Thanks for playing! Great to have you on the chat, jang... thanks for playing! Your page is great!! I posted the original so you can compare now. Mine! THanks for the fun chat ladies! Amson It's a style- I think I made it- my settings are: Bevel & Emboss (Pillow Emboss, Smooth, Depth 62%, direction up, size2, ange 45*), Inner shadow(20%opacity, Angle 45*, distance 1, size 1), Drop Shadow (White, 66% Opacity, angle 45*, distance 1, size 1) Hope that helps! Thanks Amie, I'll create my own style from this. Looks fantastic. Lovely Amie! I see you took on my &quot;white space challenge&quot;... I was excited to see what you came up with and it's beautiful! Thanks for playing along -- I just posted the original so you can see. Here's mine - and thank you! 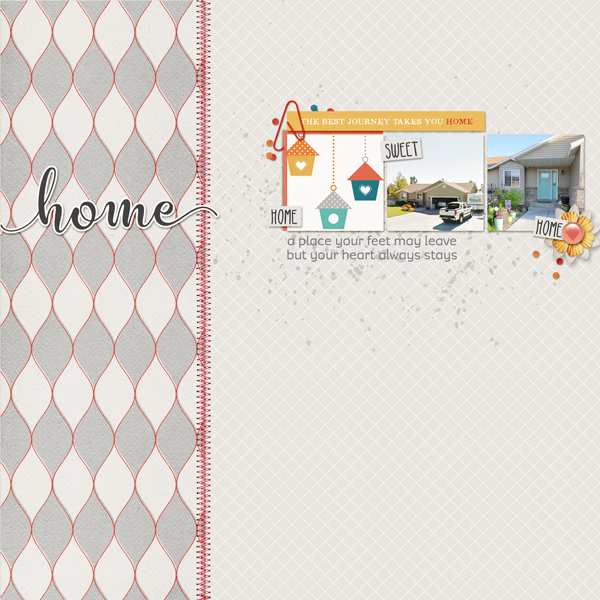 Lovely page, scrapastrophe... thanks so much for being on the chat and congrats on your giveaway prize win! Your page is wonderful... you can check out the original now at the top of this thread. 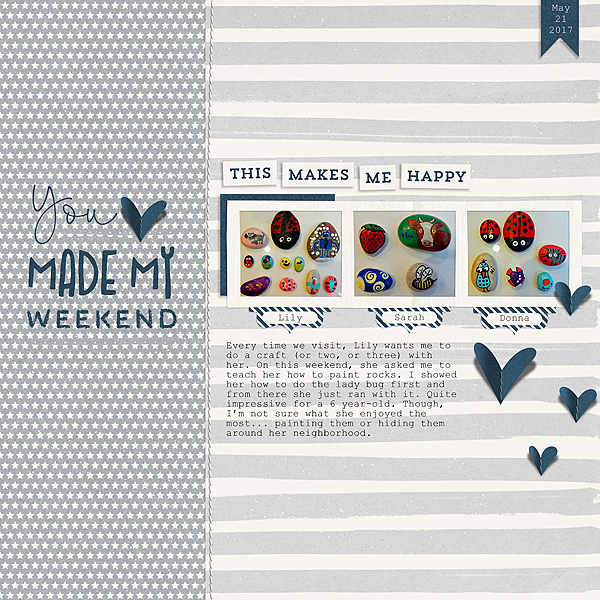 Wonderful page -- love your color palette and pictures. 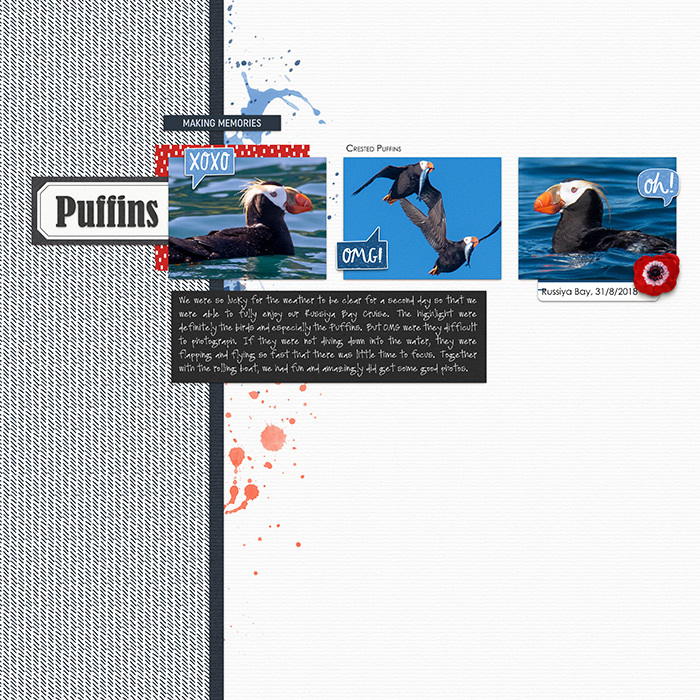 I just went to Iceland and we were hoping to see puffins but did not. So... I lived vicariously through your page! I just posted the original so you can see where the Slow Scrap started. Thanks for playing! Love to see all the different looks with the same instructions. Here is mine. What fun and wonderful colors! 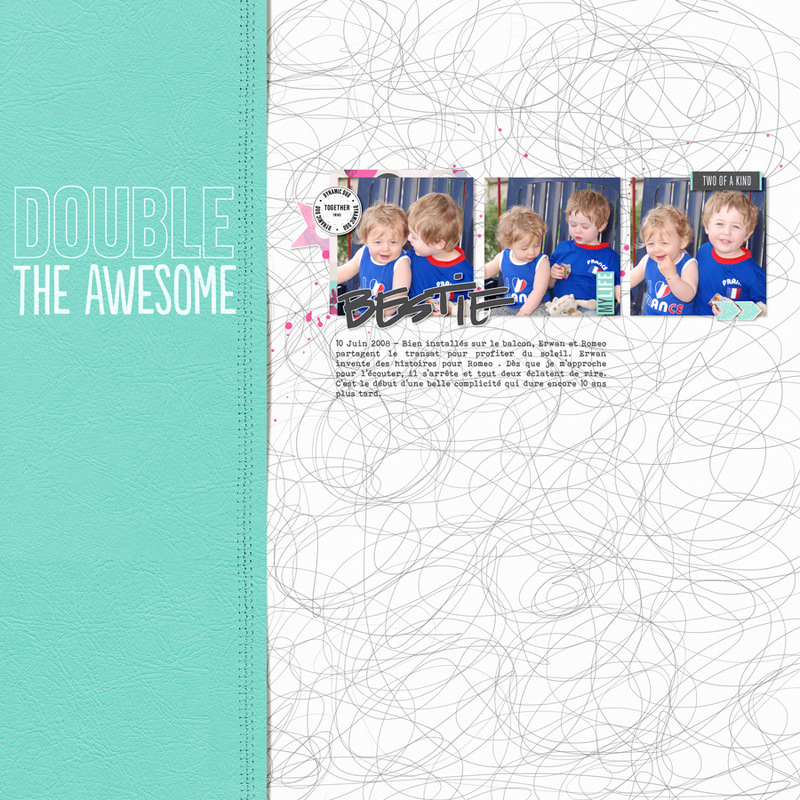 Your page turned out great! You can see the original now, I just posted it. Thanks so much for playing! Just look at those cuties! Lovely lovely page, you did great! Thanks for playing! You can check out the original now. It's at the top of this thread. Donna this is awesome! I totally want to learn how to paint rocks! Do you have to use a special paint? Lovely page, thanks so much for playing along! You can check out the original at the top of the thread now. Sorry I missed this -- but still going to play along.